DAYTONA BEACH, FLA – Momentum has shifted back and forth this year among three of the top four drivers in the championship standings for the NASCAR K&N Pro Series West.With three wins each – Derek Thorn, Greg Pursley and Michael Self account for nine victories in 11 races so far. Each has appeared to have been the one to beat at various times this season. Not to be overlooked, however, is Cameron Hayley. While still looking for his first victory in NASCAR K&N Pro Series West competition, the 17-year-old Canadian from Calgary, Alberta has turned in a solid performance this season. He has top 10 finishes in every race and is second in the standings. All four drivers hope to get an edge in the championship battle this week when the series visits NAPA Speedway near Albuquerque, N.M., for the NAPA Auto Parts 150 presented by NAPA AutoCare Centers on Saturday, Sept. 28. It is the 12th event on a 15-race schedule. Thorn leads the standings, with a 19-point advantage over Hayley. Pursley has moved to third, 24 points out of first, while Self is 25 points out of the lead in fourth. Hayley, a member of the prestigious NASCAR Next program, captured the spotlight at the beginning of this year – by winning the inaugural UNOH Battle at the Beach non-points event at Daytona International Speedway. Although he has yet to get to Victory Lane in a series points event, the young second-year driver leads the series in a couple of categories. Wheeling the No. 24 Cabinets by Hayley/GPM Ford for championship car owner Gene Price, Hayley has won the 21 Means 21 Pole Award by Coors Brewing Co., six times – four more poles than any other driver. He has an average finish of 5.0, which also leads the series. He has eight top fives and 11 top 10s, including three second-place finishes, and has led 206 laps of competition. In addition, Hayley and Pursley – teammates at Gene Price Motorsports – have qualified the two GPM cars side-by-side on the front row in five events this year. PLACE: NAPA Speedway, Albuquerque, N.M. EVENT SCHEDULE: Saturday: Practice 1-1:45 p.m., 2:15–3 p.m., Qualifying 6 p.m. This past weekend marked the end of race 11 and the final road course in the NASCAR K&N Pro West Series schedule and also marked another tough weekend for the Cabinets by hayley team. Earlier in the week Hayley attended the NASCAR NEXT event in Chicago. During his time there, he went to various different media events including the Contenders Live Chase media day where he met and talked with the 12 drivers in the Chase for the Sprint Cup as well as getting the opportunity to get interviewed on stage by Dale Jarrett! Hayley flew into Salt Lake City early Friday morning after attending the NASCAR NEXT event in Chicago, determined to gain some valuable points on the series leader Derek Thorn. Early in the year Hayley proved that he had what it took to win a road course after two very impressive showings at both previous road courses coming out with a pole and second place finish. Early on during race day on Saturday, qualifying was rained out due to some bad weather and forced NASCAR to start the race based off of current points standings putting Hayley second on the starting grid for the Ion Camera Utah Grand Prix. As Hayley knocked off each lap one by one there was always a concern for another caution to come out and take away his lead. Sure enough it came and put Andrew Ranger, a fellow Canadian, behind him on a restart. Hayley got a good jump on the start and got a great 5 car length lead over Ranger by the end of turn 11 before entering the straightaway. Going into turn 13 Ranger performed a banzai move making contact and spinning Hayley into the gravel. This put Hayley back to 6th place and gave him a flat tire prohibiting him to gain any spots back and ultimately finishing the race in 6th. Not the run the team was looking for after leading the most laps in the race, but overall another solid run for the team maintaining 2nd place in the points battle. Derek Thorn also had some problems landing him a 9th place finish allowing Hayley to gain 4 ever so valuable points in the standings with 4 races to go. Up next, the NASCAR K&N Pro Series West travels to NAPA Speedway in Albuquerque N.M., on Sept. 28 for the NAPA Auto Parts 150 presented by NAPA AutoCare Centers. Check out this awesome article in En Route magazine for Air Canada! We caught up with 16-year-old race car driver and Calgarian Cameron Hayley before he flew off for a race in Denver, Colorado. Cameron Hayley was 15 years old when he became the youngest-ever driver to start in the K&N Pro Series West, earning a place on the Nascar Next 9, a group said to be the future of the sport. Ranking third so far this season, the 16-year-old Calgarian spends more time in airplanes than in race cars. We caught up with him before he flew off to a race in Denver, Colorado. I always bring licorice to the track. It's tough to find the long Nibs in the U.S., so I bring them with me. When I started racing at 12, my crew chief's wife dangled a Nib in front of my windshield and promised if I qualified, I could eat it. I qualified first. What's your favourite food city? My new crew is really into seafood, but my dad and I aren't. In Phoenix, they brought us to Pappadeaux Seafood Kitchen and made me try alligator, clams, mussels… Talk about peer pressure! Alligator was like a more tender chicken. Everybody says that everything "tastes like chicken," but it literally tasted just like chicken. What was it like racing cars before having your drivers license? I got that question a lot going through customs at 15; the customs agents had a hard time believing me before I got my license! 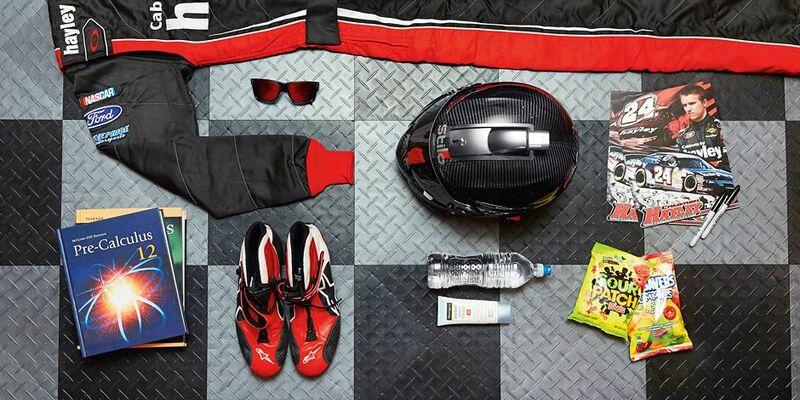 I tried to explain that you don't need to know the rules of the road to race. How do you discover a new destination? Most of the time, we're speeding from one destination to the next. When you're doing three-hour round-trip flights each weekend, it's fly in, race, fly out. But we always end up at the mall, eating chicken wings at a Red Robin. It's my mission to eat great wings every place we go. Calgarian Cameron Hayley has been tearing it up on the NASCAR K&N Series. The list of successful Canadian NASCAR drivers pretty much ends before it even begins. That doesn’t sit well with Cameron Hayley, a young Calgarian who seems poised to put the Great White North on the stock-car map. While Canucks like Ron Fellows and Andrew Ranger have competed in both Nationwide and Sprint Cup races in recent years, Hayley boasts potential that could elevate him above the accomplishments of those who have come before him. 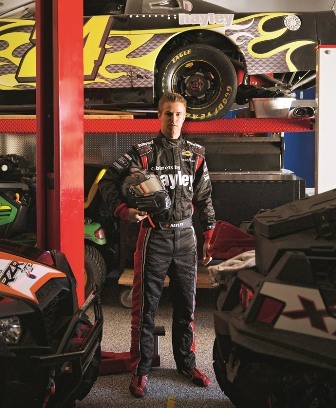 Since becoming the youngest driver to race in NASCAR’s K&N Pro Series — essentially the sport’s development circuit — Hayley’s risen the ranks, and he was selected to be a member of NASCAR’s Next program for exceptional young talent for the past two seasons. In February’s Battle at the Beach at the Daytona International Speedway, Hayley made history when he became the first Canadian to ever win a race at stock-car racing’s most revered track. Hayley followed up that win with a second-place finish the first weekend of March at Phoenix International Raceway. While his first season on the K&N Series last year showed glimpses of what he might be able to accomplish, Hayley attributes a switch from the Bill McAnally Racing Team to the Gene Price Motorsports Team with helping him step up this year. At Gene Price, he’s partnered with crew chief Jeff Jefferson and reaped the benefits of the seasoned pro’s wealth of racing knowledge. “He’s someone I’ve known for two or three years, and I’d always wanted to work with him,” Hayley said. “I just felt like him, and I had that connection that no other crew chief had with their driver. The proudly patriotic high-school student also raced twice on native soil this summer in the NASCAR Canadian Tire series, but he admits a move south is probably necessary if he’s going to race in the Sprint Cup. Until this point in his career, Calgary’s served him well. Hayley got his first go-kart when he was only four years old and began racing them he turned seven. He’d gradually make his way into bigger cars, but since Calgary’s Race City closed in 2011, he’s struggled to get the time he needs behind the wheel. Fortunately, Hayley’s inclusion in the NASCAR Next program — previously the Next-9 — has offered him opportunities to learn about some of the other challenges that come with professional racing. That includes media training and dealing with off-track distractions. It also gave him the chance to meet his idol, Jeff Gordon. “I was definitely expecting a lot different — he was quite short,” Hayley said with a laugh. “We took a picture, and he was about half my size. “But he was nice to talk to, he listened to me, and he was just telling me he hopes to see me in the Sprint Cup when I’m old enough. It was cool that at least he recognized me as a good driver. Now, Hayley hopes Canadian kids will soon have one of their own to cheer on. Cameron Hayley is a young 16-year-old Canadian racecar driver who is already in his second year of full time competition in the NASCAR K&N Pro Series in the USA. In his first race at just 15 years old he finished in an astounding second place! Since that time the fan favorite has won several Pole Awards and amassed several top 3 finishes. At the beginning of the 2013 season he won the infamous event at the historical Daytona International Speedway! Competing with veteran drivers twice his age or more, his next win is just around the corner. To say that Hayley is turning heads in the largest spectator sport in North America is an understatement. For the second year in a row Hayley has been named to the “NASCAR Next” program. This is a small group of hand picked drivers that NASCAR expects to make it as future stars at the top of the sport. They choose these drivers not only because of their on-track talent but because they have a complete package. Recently the Hayley Motorsports Team chose Ronald McDonald House as their “Official Charity.” They did this because of their commitment to helping children and their families when in times of need. 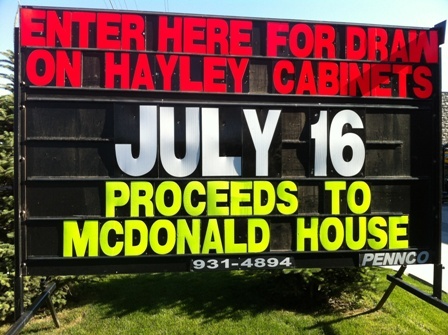 Ronald McDonald Homes are located throughout Canada and the USA where Hayley competes in NASCAR events. Recently Hayley and his team put together a great fund-raising event for one Ronald McDonald House location; One which is in the midst of a much needed expansion because there are families that unfortunately get turned away. The need is much bigger than the home can house. This is a common theme for many of these homes that work so hard to provide families a place to stay together when one of their children are seriously ill in a nearby hospital. The Ronald McDonald Homes are located in major cities where children are treated for things like Terminal Cancer and Heart problems. Many of these children are infants and this charity provides the much-needed assistance that these families cannot find anywhere else. Often times the associated expenses skyrocket and the families are left financially strapped with nowhere to go! Ronald McDonald House is a place where families can stay together. Their other children can stay with them during these times of crises and keeping the family together aids in healing and a much needed sense of normalcy when its needed most. Families often have to travel to other cities for the surgeries and the treatment required for their sick child. “Allowing them to do so with a warm place to stay together is very important” says Jim Messner a member of the Hayley Racing organization who recently experienced this with his own family. Messner states; “In our case our latest Grandchild was born with four serious problems within his little heart. Our Daughter and Son In-law had another 2 year old to care for at the same time and they had to travel to another city for the heart surgery. Ronald McDonald House provided us a place to stay all together as a family. This way we could help and look after our two-year-old grandson as well we were able to help with the 24-hour shifts of care at the hospital and stay and care for each other’s needs too. It was a stressful & tiring time for everyone but I can’t imagine what it would have been like without Ronald McDonald House. We didn’t have to even cook a meal! Even though the race team was already considering Ronald McDonald House as a charity to give back to, this experience brought it home as a must do for the team. As a result the team has recently completed their first fund raising event tied in with an exciting NASCAR race and more events will be coming down the road. For this event they put together a program with local media and live radio on site at a Free BBQ where the public was invited to attend. The event included racecar displays, autographs and a raffle for several donated prizes, one alone worth well over $4000.00. All the proceeds went to the local Ronald McDonald House and the community just loved the idea that the proceeds raised were staying in their local community. Typically the team will visit with the children and families struck by these serious events. Then they use the excitement of NASCAR to raise awareness and funds. They even invite the families to the track as their VIP Guests if they are able to come. 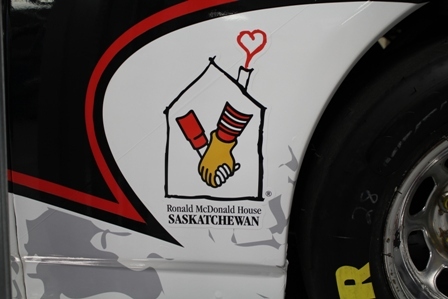 If you or your business would like more information on how to participate as a “partner” in the “Racing for Ronald McDonald House” program contact the Hayley Motorsports Team. They would love to talk with you about this very worthy cause.